On the Pleasures of the Window Seat | Williamson Williamson Inc. Sometimes the details get noticed...On the Pleasures of the Window Seat in today’s Globe and Mail. The window bench in the House in Frogs Hollow was conceived of for a fairly practical reason. The Loewen window we used only came about 7-1/2′ tall. We didn’t want to have a transom above the window to fill the 9′ tall space, so we shifted the windows up and installed the bench below. As you can see on the right side of the fireplace, the same size window sits on the floor and the space above holds ducts and structure concealed in a bulkhead. The bench is solid maple with a stainless steel liner in the wood storage area just to the left of the fireplace. The other bench storage areas hold the stereo equipment and speakers with the wires running through a chase in the back. 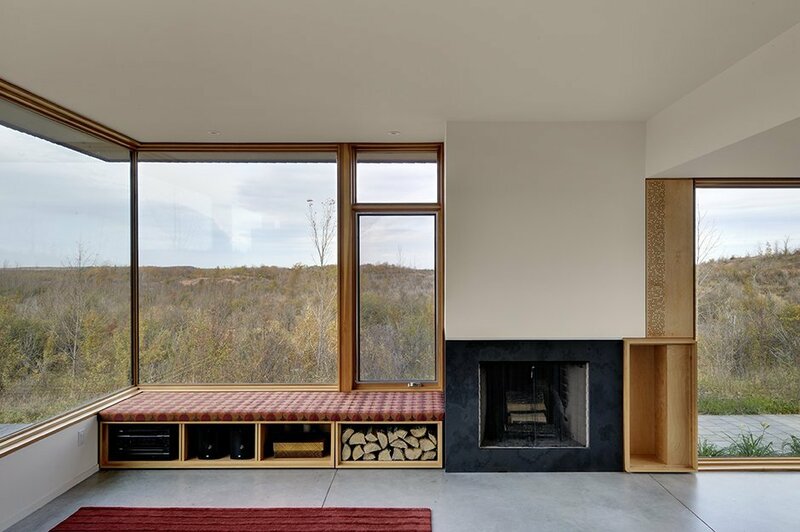 We configured the bench to relate to the maple panels on the other side of the fireplace that conceal a fresh air vent and a structural column while providing a place to house the fire tools. The cushion on top of the bench was custom made in 2-1/2″ thick high density foam. It is a very comfortable place to lay and read in both the summer and the winter. We looked at a lot of fabrics at Maharam and finally chose the pattern ‘Venn” in paprika colour because it matches the natural colours in the landscape and helps to tie the inside and outside of the house together. The fabric is quite durable and has held its colour well, even with so much exposure to direct sunlight.